Strawberries and balsamic vinegar are a classic (Italian?) combination, but I was totally unfamiliar with it prior to a year or so ago. I mean, I'd seen in places, and heard it was awesome, but never felt compelled to try it myself. So one night I tried it over a piece of pound cake, and was immediately hooked. I've since made caprese salad with it and strawberry-balsamic flatbread. I just can't get enough. The super sweet and beautiful strawberries play off the slightly sweet and bracing flavor of the vinegar. So it should come as no surprise that I was intrigued with the combo as an ice cream flavor. I was super excited to make it, but was a little worried that the vinegar would be too strong and overpower the strawberries. But it was perfect. Just a hint of the vinegar in the background... something to make you ask "what's in this that makes it taste so good?!" You might catch more flies with honey, but you make better ice cream with vinegar (yes, I went there. Sorry.). Combine the berries with the sugar and vinegar in a large nonreactive skillet (stainless steel or nonstick - do not use cast iron as the vinegar is too acidic). Cook over medium heat, stirring frequently, until the strawberries are soft and the liquid has reduced and thickened a bit, about 6 to 8 minutes. Remove from heat and cool slightly, then puree the berries and their juices in a food processor or blender until smooth. Refrigerate until ready to use. To make the ice cream base, whisk the yolks and 1/4 cup of the sugar in a large heatproof bowl. Set aside. In a medium saucepan, stir together the cream, milk, salt, and remaining 1/4 cup sugar. Heat the mixture over medium-high heat, stirring often, until it just comes to a simmer; reduce heat to medium. Use a ladle to carefully scoop out about 1/2 cup of the mixture (I just did 1-2 ladle-fuls), and whisking the eggs constantly, add the cream to the bowl with the egg yolks. Repeat with another 1/2 cup of the cream mixture. Using a heatproof spatula, stir the cream in the saucepan constantly as you pour the egg-and-cream mixture from the bowl to the pan. Over medium heat, cook the mixture, stirring constantly, until thickened and coats the back of the spatial, 1 to 2 minutes longer. Remove from heat. Set a fine-mesh strainer over a clean bowl, and pour the base through it. Set the bowl in an ice bath, wash your spatula, and the the base occasionally until it's cooled to room temperature. Remove the bowl from the ice bath, cover with plastic wrap, and refrigerate at least 2 hours, but preferably overnight. 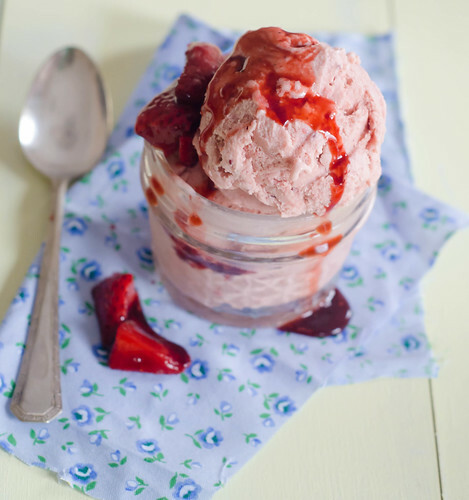 To freeze the ice cream, whisk the strawberry puree and remaining 2 teaspoons of balsamic vinegar into the chilled base. Freeze the ice cream according to the manufacturer's instructions. As the ice cream churns, place the container that you plan to store the ice cream in into the freezer to chill. When ready, transfer the ice cream to the prepared container and freeze for at least 3 to 4 hours. do write in my diary every day. I'd like to start a blog so I can easily share my personal experience and views online. Please let me know if you have any recommendations or tips for new aspiring bloggers. Thankyou! This ice cream sounds soooo lovely, Josie! Perfect for summer!! I recently made strawberry basil sorbet and I put a balsamic reduction over it, so good. But now I want to try it mixed in! Great picture! It sounds so good and refreshing! This sounds very interesting, and look so luscious! I've made this ice cream before and LOVE IT. It's seriously one of my favorites!